Inside, clean, simple styling greets you, along with nice, high-quality materials. I really love the multiple tones and colours in this Signature trim. The warmth of the leather contrasted with the metal trim and the beautiful genuine Rosewood trim on console and door panels is really something to behold. The heated steering wheel is a joy in hand, and the heated and ventilated seats are upholstered in stunning Nappa leather with premium stitching details. They're delightfully comfortable and well-bolstered. The central 8-inch touchscreen is a bit of a reach, but can also be controlled with the rotary HMI controller on the console. The system is slowly starting to feel a bit dated with its many nested layers, but it still works fine. Apple CarPlay and Android Auto are integrated and the BOSE system is excellent. A shout-out to the voice recognition is called for here – it was 100% accurate for me during my week with the CX-9, and that is very unusual. There's a boatload of driver assistance technology in this trim. You get brake support, blind spot monitoring, rear cross traffic alert, radar cruise control, automatic high beams, lane departure warning and lane keep assist, a heads-up display and a surround-view camera. The 2.5L turbo-4 remains unchanged, putting down 227HP (250HP with premium fuel) and 310 lb.ft of torque. The 6-speed transmission carries over too, and of course so does the I-ACTIV all-wheel drive system. Mazda rates the CX-9 at 11.6/9.1 L/100 km city/hwy, and we averaged 12.1 L/100 km over the course of a very, very cold week in it. I found that to be excellent for an all-wheel drive this size. The engine provides good power off the line but the whole package feels a bit soft once you're on the move. Although it's never slow or underpowered, it feels like it could be snappier. Putting the vehicle into Sport mode does make things a bit more responsive. When you send the revs soaring, the engine exhibits some very minor coarseness – nothing untoward, but not quite as smooth as the V6s you find in this class. 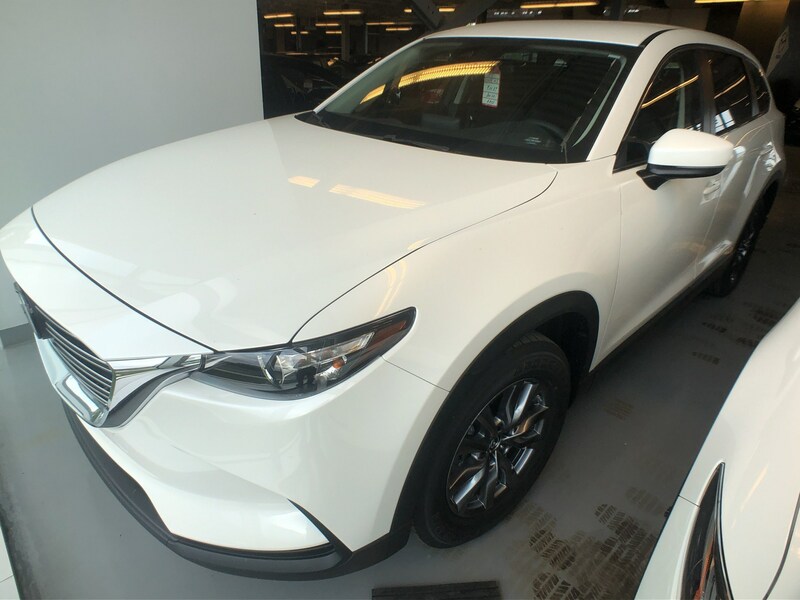 The transmission is delightful and smooth, but I can't help thinking a more modern transmission with a couple more gears would give the CX-9 that extra oomph that is missing on the road. The manual shifts are surprisingly quick and satisfying – something I generally would not expect in this vehicle category. There's definitely nothing missing in the even-more-refined-for-2019 suspension department. The handling is outstanding, particularly for a vehicle this size, and I would go so far as to say it's actually fun to drive. On top of that, there's no compromise in ride quality. It's comfortable and very quiet, even at highway speeds - Mazda spent some time enhancing the already outstanding noise insulation and sound absorption and it shows. Braking is not an issue – the pedal has good feel and is easy to modulate, and can haul things down quickly when needed. The visibility out of the vehicle is good although the third row headrests can get in the way of perfect rear vision. If you tow things, the CX-9 can lug up to 3,500 pounds around behind it. WAF (Wife Approval Factor) was high. She felt it looked and drove like a very expensive vehicle and she said it would be easy to live with everyday. I genuinely love the CX-9. Mazda knocked the styling out of the park for me, and it's a rewarding driver's vehicle while remaining notably efficient at the gas pumps. It offers enough utility and space to be competitive and the pricing stays in line with the competition as well. All in all, it is a solid package that has most everything that most buyers in this category are after. It would be on my shopping list if I was in the market for a mid-size 3-row SUV. Tom Sedens is an Edmonton-based automobile journalist, husband, dad and driving enthusiast, as well as an accredited member of AJAC.